Motherhood is a life-changing rollercoaster journey full of highs and lows. Hang on tight and enjoy the ride! It can be exhilarating, enjoyable, exhausting and terrifying. Early motherhppd can be a deeply fulfilling experience, yet it can also be a testing time for many women. Motherhood is achingly beautiful, yet it can also bring pain and heartache. It really is the toughest, most important job you'll ever love. There are many pressures on families today. New mothers often have to navigate a minefield of conflicting advice and often parent without close networks around. Consequently, sometimes mothers of young children find themselves unexpectedly anxious, overwhelmed and unable to trust their instincts. Heart Matters in Early Motherhood covers a wide range of issues that mothers of young children face, whether having an only child, a large brood, living in the golden zone or the war zone, staying at home or going out to work, married or raising children alone. 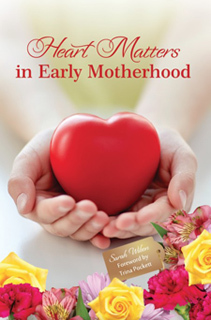 Written by a psychologist and mother of three, this book captures the matters of the heart that often surface during early motherhood. With honesty and transparency, Sarah describes the challenges that she has faced, and provides encouragement and inspiration for mothers everywhere. Published in the UK. Distributed in NZ by Castle. Sarah Wilson is a wife and full time mother of three. She is still very much 'in the trenches', with children aged eight, five and three. Sarah is a trained and registered psychologist. She has also completed Christian counselling and prayer ministry training. Sarah is a keen blogger and writer. Her other interests include music, graphic design, photography and all things creative.